When playing Sparta, it is critical to understand the way in which battles are calculated. This would appear to be very simple, but many players struggle to grasp battle mechanics. However, once you get the gist of the way battles work, you will realize that high strength value attacks are no more effective than low strength value attacks, and thus the whole system can favor both David and Goliath! The prime example of my theory is demonstrated when both sides have the exactly same strength. This means that both sides have exactly 50% of the total strength and thus (generally speaking) lose 50% of their troops. However, if one army has 75% of the strength in the battle, it will only lose roughly 25% of its strength, while the smaller army will lose 75%. If the strength ratio is 90% to 10%, the side with 90% loses 10% and the side with 10% loses 90%. So what does this mean? The main conclusion is that in both sides lose roughly the same amount of actual power in each battle. For more information, see the chart below. Although this sounds strange, in the above example, even though the stronger army’s losses are 9 times smaller, the army was 9 times bigger to start with, making the actual losses identical. However, this is only really good for calculating losses, not finding the right strategy to beat your enemies. The answer to the latter issue is determined by three factors. Due to the fact that different types of troops take different amounts of time and Resources to train, the time it takes for an army to recover from a battle can vary. As such, battle losses should be calculated not only in terms of Power Points destroyed, but also in terms of the time and Resources required for reconstruction. This should be taken into account when choosing which Units to train and which ones to send into battle. Cheaper, easier to train Units are usually your best bet in these scenarios. For instance, to train 1 million offense in Macedonian Cavalry requires twice the Resources and 20% more time to train than the same equivalent power of Javelineers. In practice, this means that in a battle between 2 million power of Macedonian Cavalry and 2 million power Javelineers, both sides will lose approximately 1 million in strength. However, it will cost the army army of Macedonian Cavalry nearly 7 million more resources and take 19 more days to recover from these losses. As you probably already know, each Unit defends differently against the different types of attacking Units. 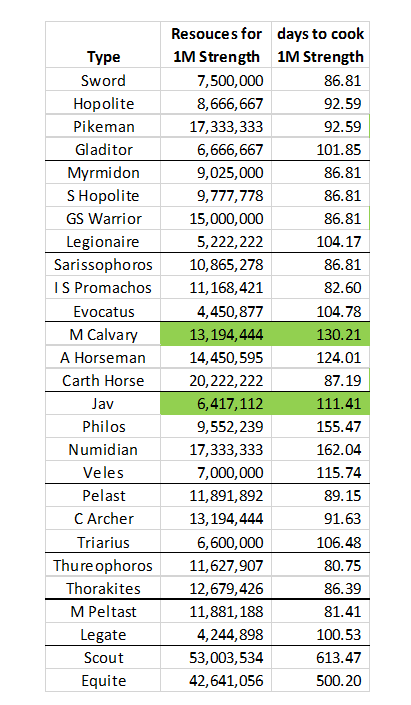 Take a Theophorus for example, which despite having an average defense of 400, has 500 Defense vs Cavalry and Phalanx Units, but only 300 against Light and Heavy Infantry. This gives you a huge advantage against certain armies, but weakens you against others. Therefore, choosing the correct Units for the battle you are planning is an integral part of your strategy. There are many ways you can improve your Units to make them more effective in battle. Improved Units essentially give you more bang for your buck: you get more strength with a lower number of Units, meaning you lose fewer Units, which in turn cost you fewer Resources to retrain. 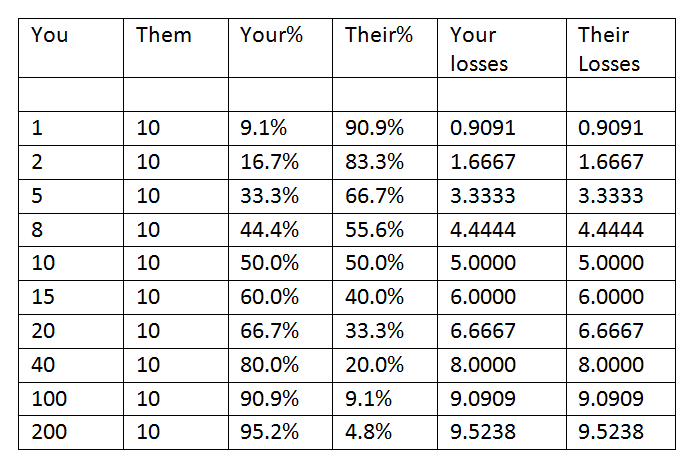 The table below takes Myrmidons as an example, which have a default value of 240 Offense. It assumes that you have roughly 1,000,000 Offense in the battle, coming against the same value of Defensive Units. It then shows how battle casualties per 1 million Offense are reduced, the further you upgrade the Unit. 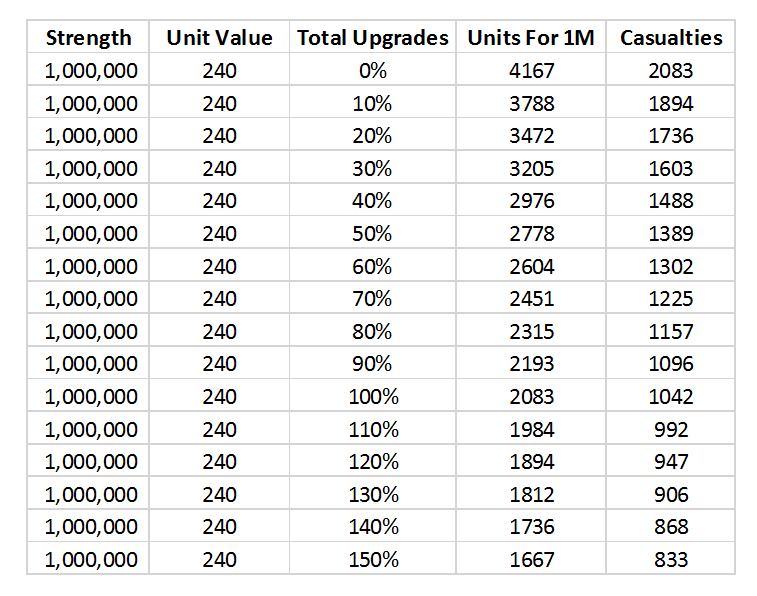 You can see from the table just how much Unit Upgrades dramatically reduce your losses. You would lose 2083 Myrmidons in a battle of this type if the Units were standard, but if your Upgrades totaled 150% you would only lose 833 Myrmidons! There are at least two exceptions, where I think the above information could be skewed. The first is the what I call “overkill”, when one side is at least 100 times more powerful than the other. In these situations, the larger army can lose far less than the smaller army (and the smaller army’s losses are usually around 100%). The second is essentially a rounding trick. Let’s assume you are the larger army (by a factor of 4), so according to our previous calculations would lose a fifth of your troops. However, if you only have 1 of a particular Unit, you theoretically won’t lose it because the formula says you should lose 20%, which it rounds down to zero. It is my belief that this can be exploited to create a “death blow” attack in which you lose zero troops. Work on signing Agreements. Choose a few Units that you know work well in battle, then try to max out these agreements. Obviously this works better for more powerful Units, but you can still significantly improve lower power ones too. General’s Equipment. Depending on your strategy, sometimes it is better to break lower Level, higher Class Equipment in order to focus on creating top-Level Equipment that is just for Light Infantry Units. You can also change your General’s Equipment to suit your strategy for the next battle. Elixirs. We have shown that every percentage point counts when it comes to increasing army strength. You can essentially “double down” on this by dedicating your army to Offense or Defense, and then stocking your Elixirs accordingly. If you have both Offensive and Defensive Units, don’t be afraid to keep one slot filled with a Level 4 Elixir, so it can be swapped for free on a battle by battle basis. When you are attacking, make sure to send Spies to determine the strength of your enemy and to make a note of how well your Units perform against other Unit types. Sometimes you can pick off a more powerful opponent cheaply with an army made up just of Light Infantry Units. When you are defending, make sure to protect your City with all 4 Unit Types. Failure to do so could mean being exploited by attackers who know their onions as far as Units are concerned, and could lose you valuable Defense Points in the Rankings. If someone is attacking you on a regular basis, learn their tendencies to be able to counter them better. In summary, my opinion is that you can exploit the key calculation that both sides lose the same amount of strength per battle, regardless of their total army strength. This means that attacking or defending with 1 million or 10 million strength has virtually ZERO impact on determining who loses the largest amount of power. Therefore, small armies probing and looking for positive situations can still find positives against the biggest armies. This article was originally written by Dean Zaremba, who has granted permission for it to be posted on Plarium.com. Any thoughts or views expressed herein are the player's own, and do not necessarily reflect the views of Plarium Global. Please note that the Sparta Battle Calculator described in the article is not officially endorsed by Plarium, nor has it been proven to be accurate, nor does it necessarily correlate with the battle calculations made by the company.